Maggie May opened at London’s Adelphi Theatre on 22 September 1964 and ran for 501 performances. The plot pits love against the class struggle, with the eponymous prostitute falling for an Irish-Catholic docker caught up in a dispute about illegal shipments of guns through the port. Yes, it’s the sort of show where the guys sing about the union and solidarity with workers in South America, and the dolls sing only about guys. And, yes, its a honey-hued image of (exclusively white) working-class Liverpudlian life. But with its heart in the right – or rather, left – place this is a populist tragi-comedy (and production) in the finest tradition of Joan Littlewood. Composer Lionel Bart was part of Joan Littlewood’s Theatre Workshop at Stratford East and with writer Frank Norman created the Cockney musical Fings Ain’t Wot They Used to Be. This opened in Stratford in early 1959 before transferring to the West End in February 1960. By which point Lionel Bart had premiered his Henry Fielding adaptation Lock Up Your Daughters, 1959, and was four months away from opening his greatest hit Oliver!. Nothing later lived up to that, although Blitz!, 1962, is fondly remembered by some, not least for Sean Kenny’s astonishing set. Maggie May followed in 1964, before the spectacular artistic and commercial failure of the Robin Hood musical Twang!! (with two exclamation marks) the following year. Littlewood was the first director on Twang!! but quit before it opened as a legendary alcohol- and drug-fuelled fiasco. Maggie May comes from the culture of the fascinating moment just before ‘swinging London’ cohered as a potent media myth. The first night was a month before Labour’s Harold Wilson won the election to end 13 years of Tory mis-rule. Goldfinger, the third James Bond movie, had just opened and The Beatles had just finished the European leg of their world tour. A Hard Day’s Night with the group had been first screened on 6 July 1964 and was proving to be a massive hit for United Artists. The screenplay for A Hard Day’s Night was written by Alun Owen, who also penned the book for Maggie May. Both gigs seem to have come about thanks to his 1959 original script for ABC’s Armchair Theatre, No Trams to Line Street (broadcast live, and there’s no known recording). With a Liverpool setting, this slice-of-life drama is about three sailors on shore leave, a situation recalled directly in the song ‘Casey’ in Act 1 of Maggie May. Owen had also had his first full-length play, which he wrote initially for radio, Progress to the Park, 1959, produced by Joan Littlewood at Stratford East and the Royal Court. Further notable contributions by Alun Owen to Armchair Theatre at this time included After the Funeral and Lena, O My Lena (which survives), both 1960, and The Ways of Love, 1961 and The Hard Knock, 1962, about a tough Liverpudlian seaman. All four of these plays were directed for the screen by William (‘Ted’) Kotcheff, and it was Kotcheff who directed Maggie May on the boards in 1964. The Ways of Love starred Kenneth Haigh, who had created the role of Jimmy Porter in John Osborne’s Look Back in Anger in 1956. In addition to taking a small role in A Hard Day’s Night, Haigh starred as Patrick Casey in Kotcheff’s staging of Maggie May. The female lead in that first production of Maggie May was Rachel Roberts, who had made such an impression in the feature films Saturday Night and Sunday Morning, 1960, and This Sporting Life, 1963. So with Haigh and Roberts, and Kotcheff, there is a web of links back into the British ‘new wave’ cinema and into the Royal Court-inspired ‘kitchen sink drama’ of the late 1950s. Yet with its setting and strands of social realism, the musical also looks forward into the popular music and film scene given form by the debut film from The Beatles, as well as to the television dramas for The Wednesday Play from producer Tony Garnett, director Ken Loach and writer Jim Allen. This team’s The Big Flame, 1969, is about a strike by Liverpool dock workers. The British North, through the novels of John Braine and Alan Sillitoe, the plays of Alun Owen and Shelagh Delaney, with some additional help from The Beatles, has become for Southern audiences a Grimm’s folk-tale country where everyone drinks deep, loves hard, fights long and swears hard on an industrial battlefield. With Maggie May, via Owen’s play, Bart was playing catch-up with his fellow theatre writers of the late 1950s; Maggie May is Bart’s Arnold Wesker moment, his Bernard Kops moment, his A Taste of Honey moment. In common with all of these, Bart’s moment was drawing to its close. The 32-year-old writer-composer-director [Lionel Bart] was already committed to Brookfield Productions and United Artists to write a Robin Hood musical for stage and screen production when he had Maggie May launched. But at the dress rehearsal of the new show, John Bryan, who is Peter Sellers’ partner in Brookfield, clinched a deal by which, for a $500,000 advance, Brookfield and U.A. acquired Maggie May. This, however, was not to be. Brookfield, Bryan and Sellers made just one movie, the famously troubled After the Fox, 1966, directed from a Neil Simon screenplay by Vittorio de Sica. But that’s another story. Adrian Wright suggests that Maggie May may be ‘one of the great undiscovered British musicals’. 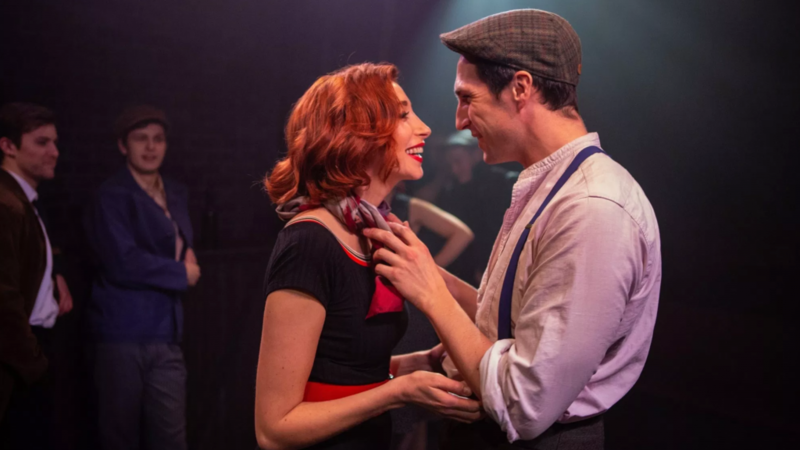 Whether or not the Finborough production demonstrates that, it is a glorious project that’s more than worthwhile for its historical interest and, just as importantly, is a terrific night out.